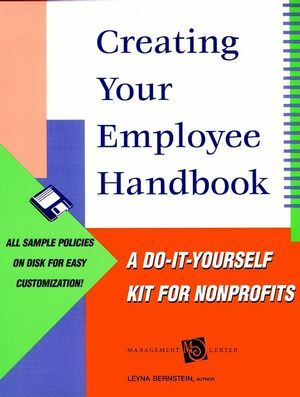 At last, busy nonprofits can produce their own employee handbookswithout the usual worries or frustrations. And employees canfinally look to a single source for all the policies and proceduresthat bear on their day-to-day work. 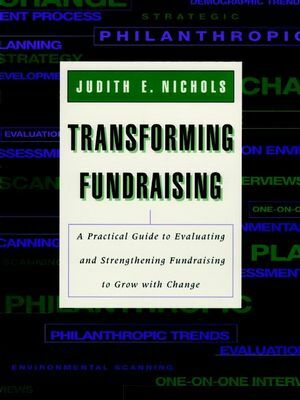 This unique book-and-disk sethas everything you need to craft an employee handbook that istailored to your organization's mission, culture, and goals. It isThe Management Center's most comprehensive human resources toolkitfor nonprofits across the country--filled with sample policies andexamples of how to adapt each policy to your specificobjectives. Flexible and user-friendly, Creating Your Employee Handbook offersa unique three-level approach, capturing the complexity anddiversity of your nonprofit. Many of the sample policies appear inversions that correspond to large, medium-sized, or smallnonprofits. Sample policies also reflect different organizationalcultures. For each policy,you can choose--mixing or matching asneeded--the language, form, and style that best reflect yourpurpose and work culture. Topics include: employment and employeedevelopment, benefits, workplace healthy and safety, standards ofconduct, work hours and pay, and much more. You can create a newemployee handbook from start to finish, update existing policies,or identify new ones. This hands-on manual can also help you gain insight into whycertain policies are legally necessary. Such important policies aretagged throughout the handbook and there is even a state-by-statelisting of specific statutes and mandates to help broaden yourknowledge of employment law. Above all, Creating Your EmployeeHandbook shows how to make your handbook an effective employeecommunications tool. The do-it-yourself kit includes a computer disk complete with allof the sample policies in PC format. The policies are organizedinto folders that correspond to the size of your nonprofit. You canselect or combine the policies according to your specificrequirements. Also included are sample forms that can be copied orsaved for future use. The guide and disk make the normally dauntingtask of creating an employee handbook that simple! LEYNA BERNSTEIN is a consultant and trainer with expertise inorganizational development and human resources management. She is aprincipal with Bernstein & Associates in San Francisco andserves as an affiliate consultant in human resources with TheManagement Center. Bernstein has provided consulting and trainingservices to organizations since l993, and now works exclusivelywith the nonprofit sector. Prior to founding her own firm, shespent over a decade as a human resources executive with some of theBay Area's leading socially responsible companies. Introduction: How an Effective Employee Handbook Can Improve YourOrganization. STARTING YOUR HANDBOOK OFF RIGHT. Policies for a Good First Impression. PRESENTING CLEAR EMPLOYMENT AND EMPLOYEE DEVELOPMENTPOLICIES. Health, Wellness, and Employee Assistance. Unpaid Time Off and Leaves of Absence. DEVELOPING FAIR, STRAIGHTFORWARD POLICIES FOR WORKPLACE STANDARDSAND PRACTICES. CLARIFYING END OF EMPLOYMENT POLICIES. Appendix A. List of Legally Required Policies. Appendix B. State by State Provisions for Selected Policies. Appendix C. Sample Forms Employee Acknowledgement Written WarningDocument Job Description Position Description Form PerformanceEvaluation Form. Appendix D. The Management Center Human Resources Assistance.